The death of Osama Bin Laden has, expectedly, evoked sharp reaction from Al-Qaeda and the Taliban, both the Afghan and Pakistani branches. The terrorists have threatened to unleash devastating attacks against the Pakistani security forces and the mainstream political parties. The daring attack by the Pakistani Taliban on the PNS Mehran Naval Base on the outskirts of Karachi in the second fortnight of May this year may well be a portent of a dangerous future for Pakistan. The last few months has been a steep rise in terrorist attacks in Pakistan, including on the military and law enforcement agencies. Increasing extremist violence threatens not just the unity and territorial integrity of Pakistan but the entire region at large. Pakistan may be the Terrorism Central for the War on Terror; but let me now explore another angle, one beyond the Pakistan: the Greater Middle East. For over three decades now, Iran has spit fire at both Israel and the U.S., whom it sees as the major backer of the former’s arbitrary and hegemonistic actions against the Palestinians in the Gaza Strip and West Bank (read Occupied Territories). The last few months have seen hectic international parleys to punish Iran for its secretive nuclear weapons programme. Economic embargo and military sanctions have crippled the Iranian economy; however, the Iranian Clerical regime has not flinched from its pursuit of nuclear weapons. More than the U.S., there are two countries which stand to lose most in case of the emergence of the Iranian Bomb: Saudi Arabia and Israel. Saudi Arabia is Sunni while Iran is the world's largest Shia republic. For decades now, Iran has been challenging the Saudi hegemony in the Islamic World. Iran's rising power ambitions threatens Saudi Arabia's leadership of the Islamic World at large and the Arab World in particular. In short, Saudi Arabia is an ideological, sectarian, and power rival. Established as a Jewish State in 1948, Israel is the first theocratic State in the post-Second World War world. Judaism (the religion of the Jews) and Islam have been at loggerheads for centuries. Also, Israel is an undeclared nuke weapons power; in this regard, Israel follows an 'ncnd' policy, i.e. it neither confirms nor denies its nuke status. Its nuke weapons make it the only nuke weapons state in the Middle East. Iran has often called for the destruction of Israel. Given Iran’s belligerent posture against Israel, it is given that the latter will try to thwart the former’s nuclear ambitions. 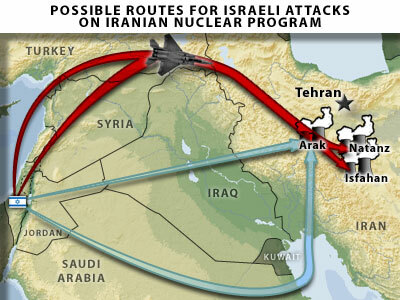 It is in this context that reports of Israel’s planned strikes against Iranian nuke plants should be understood. Israel believes that Iran, in a moment of desperation (and massive strategic geopolitical miscalculation), may launch a nuclear weapons attack against it. In this regard, questions have been raised over how Israel can manage the logistics, like flying nonstop over other Muslim States (mainly Jordan and Iraq). In this regard, in highly secretive meetings, it is learnt that Saudi Arabia has given permission to Israel (opens in separate window) to use its northern air corridor for flyover to strike at Iran’s secretive nuclear plants. Now let's look at how and what such Israeli action could mean for the U.S.-led Global War on Terror. So why does Al-Qaeda want another war in the Middle East? The scenario outlined in this complicated picture might appear to be far-fetched; however, it is entirely in the realm of possibility. As they say, in international politics there is no certainty. Also...what will be the ramifications of such an eventuality for India?